A survey released one day before the midterm election shows U.S. Reps. Martha McSally and Kyrsten Sinema in a virtual dead heat as they campaign to become Arizona’s next senator. McSally, the Republican Party nominee, leads her Democratic challenger, Sinema, 49 percent to 48 percent in the latest poll to come out on Arizona’s Senate election. McSally’s one-point lead places the contest well within the survey’s margin-of-error of 3.9 percent — indicating it’s anyone’s game in a state that is witnessing record voter turnout. The survey — released by OH Predictive Insights and ABC15 Arizona — was conducted on Nov. 2-3 and reached out to 631 likely voters via cell phone and landline. “A Republican turnout operation will be crucial to combat Democratic excitement. 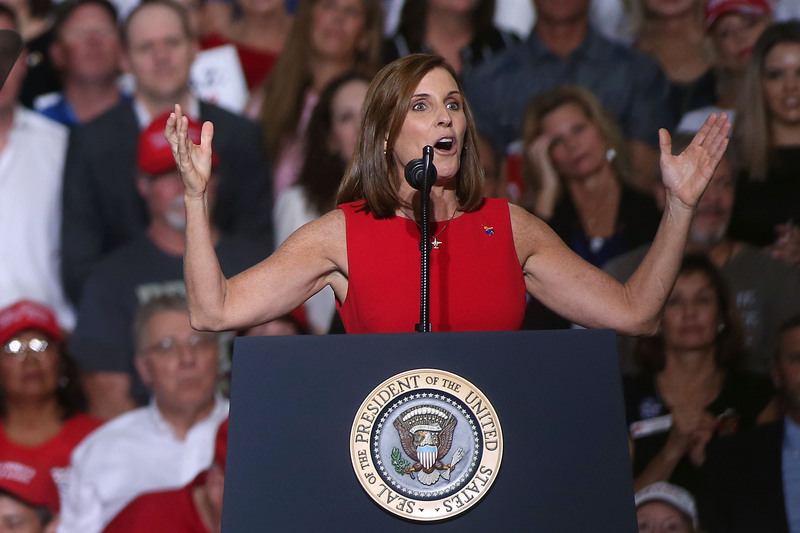 While many more of the votes for Sinema are already cast and guaranteed, McSally needs to pin her votes down and solidify them,” read an analysis from OH Predictive Insights. The survey is a sharp turnaround since ABC15/OHPI’s last survey released on Nov. 1, which found McSally leading Sinema by seven points, 52 percent to 45 percent. Several factors have shaped the neck-and-neck contest. Numerous instances of Sinema’s anti-war, extreme past have come back to haunt her in the waning days of the election. For instance, she said in a 2003 radio interview that she didn’t care if Americans wished to join the Taliban — a line she has stumbled to answer. She has also had to face negative headlines when it was revealed she was previously a part of an anti-war group that depicted American soldiers as skeletons. The Democratic congresswoman, however, was helped with the exit of Green Party candidate Angela Green five days before the election. Green — who said Sinema’s views are very similar to her own — immediately endorsed Sinema after dropping out. The Real Clear Politics average of the latest polls shows Sinema with an aggregate lead of 1.2 percent. Real Clear Politics and the Cook Political Report rate the race as a “tossup,” whereas Inside Elections gives it a “tilt Democratic” rating.